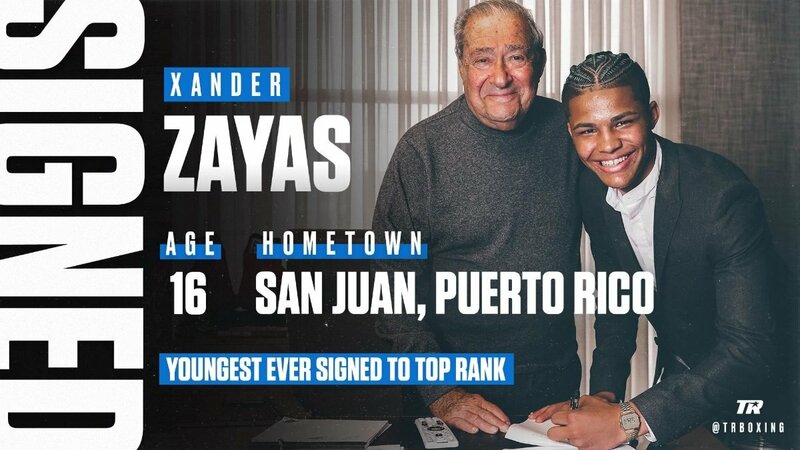 At only 16 years old, Zayas is the youngest fighter ever to sign a pro contract with Top Rank. An 11-time Puerto Rican and U.S. national champion, Zayas will make his pro debut as a welterweight in September. Zayas, who is currently 118-14 in the unpaid ranks, will represent Team USA next month at the Emil Jechev Memorial Tournament in Botevgard, Bulgaria. Zayas was born in San Juan, Puerto Rico, and moved to Plantation, Florida, at 11 years of age. A high school junior who will graduate in 2020, Zayas won gold at the 2017 and 2018 National Championships and was named the tournament’s Most Outstanding Boxer in 2018. He elected to turn pro, in part, because he would’ve been too young to participate at the 2020 Olympics. Zayas will prepare for his pro debut with head trainer Javiel Centeno at Centeno’s Sweatbox Boxing & Fitness in Davie, Florida.